Welcome Aboard to the American Job Center Career Coach, your mobile career resource lab! The American Job Center Career Coach visits towns in Southwestern Connecticut every month. 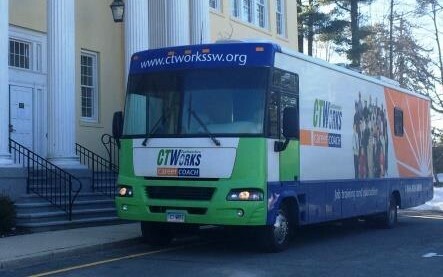 It is a one-stop shop on wheels and mobile classroom which brings career services and computer training to you! The American Job Center Career Coach makes weekly visits to cities and towns in coordination with community sites (adult education, public housing, libraries, community centers, churches, job fairs). When you step aboard the Career Coach, you are greeted by expert staff and seated at one of 10 computer workstations. Come aboard and use our high speed Internet access, and print resources at no cost to you! The wheels are in motion for you to connect with your next job thanks to the Career Coach!